"BUILDER'S CLOSE OUT INCENTIVES." MOVE-IN SPRING 2019/NEW CONSTRUCTION. Phase III consists of 77 luxury FINISHED condominiums; 8 unique floor plans. This west exposure Penthouse ASTORIA, finished in Transitional style, is an open floor plan with 1, 460 square feet of living space. 12 x 24 Studio Ice tile in the Kitchen, Foyer, Great Room, Hall and Laundry Room. Tiled balcony over 260 sq. ft. Only 3 residences available for this model! Units 215 & 515 also available. Choice of eastern or western exposure. Astoria price range from $764, 000 to $824, 000. Building Amenities include Heated Pool and Spa, Social Room, Tiki Hut, Firepit Table, and Fitness Center. 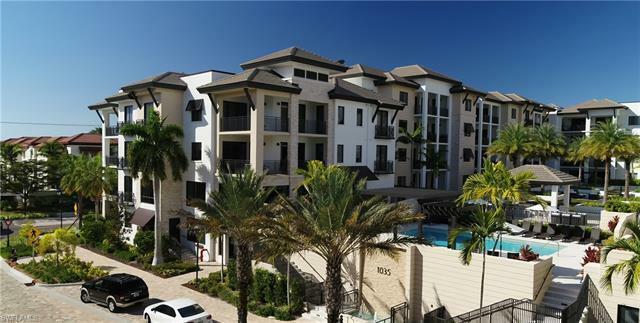 At Naples Square, you are intimately close to what you love most. Fun on 5th Avenue South is right next door. The boat slips and bistros at Bayfront are just across the street. 3rd Street South is practically around the corner. Your furry, four-legged family members will love it here since Naples Square welcomes beloved pets. Choose from a variety of floor plans with exquisite finishes like Bosch appliances and Gas Cooking! Note: Artist renderings are of a similar floor plan. Not actual unit.